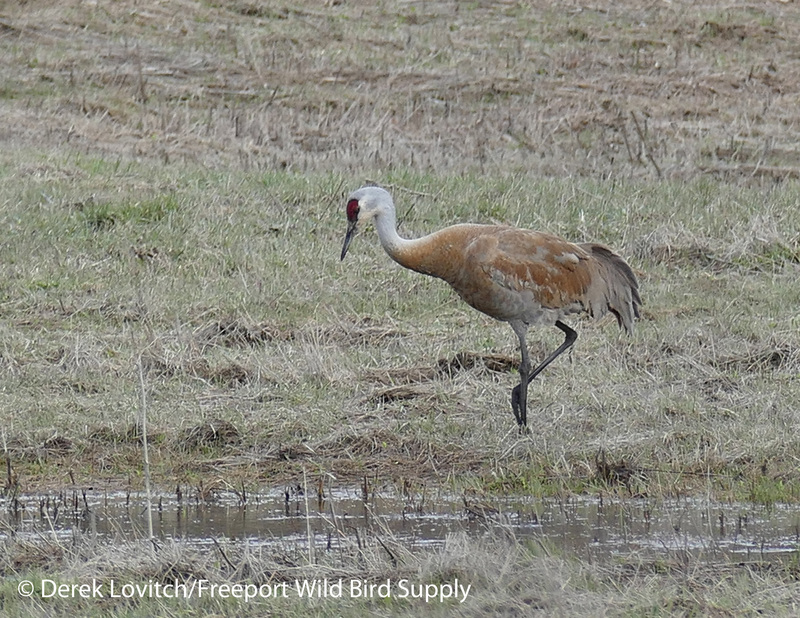 A mere decade ago, Sandhill Cranes were a truly rare bird in Maine. 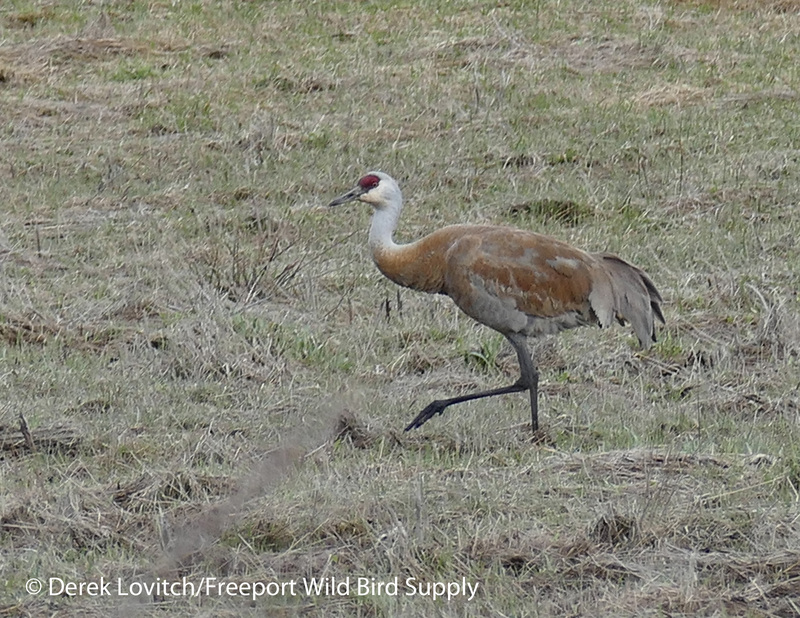 Birders from around the state traveled to Messalonskee Lake in Belgrade in the hopes of seeing “the” cranes. Even that pair, or two, was remarkable. My, how things have changed! 31 in a field together in Norridgewock last fall. The 10th of the season passing the Bradbury Mountain Hawkwatch earlier today. 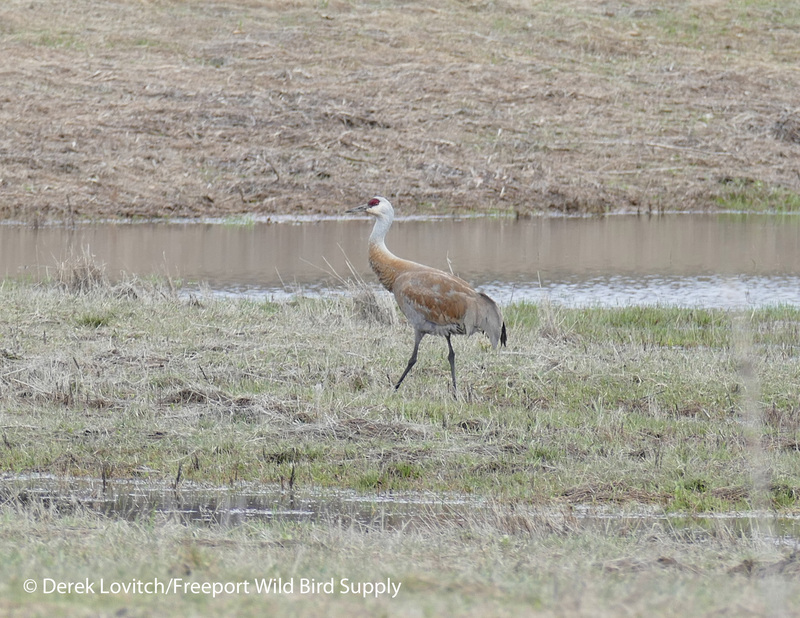 My best guess is that there are now at least 2 dozen pairs breeding – or attempting to breed/prospecting – around the state. 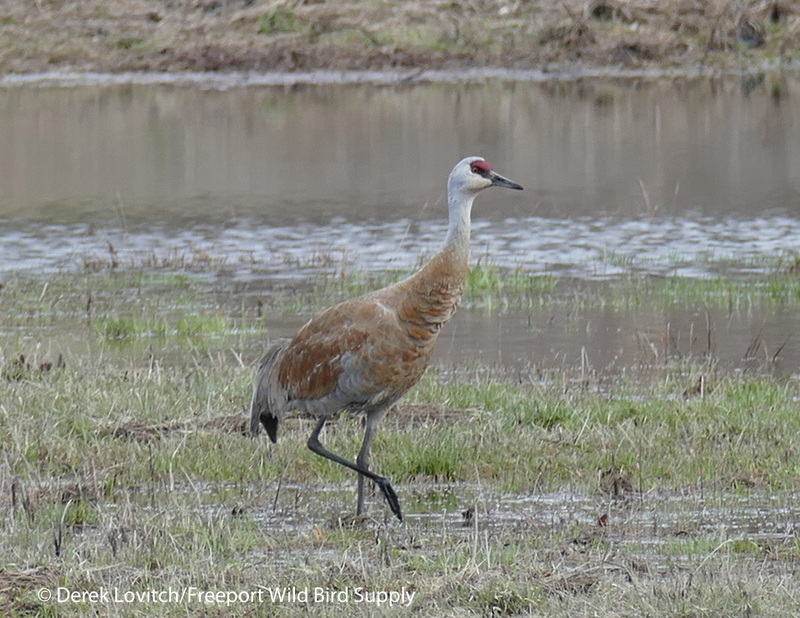 To me, this looks just like a “Lesser” Sandhill Crane: the smaller, more northerly subspecies that breeds in the high Canadian Arctic and winters mostly in Texas and the southwest. The noticeably small size – even without anything else around to compare – was so apparent, as was the more squat, or even “dumpy” shape. And look at that tiny (relatively speaking!) bill! I’ve never seen even a runty Greater that looked like that. 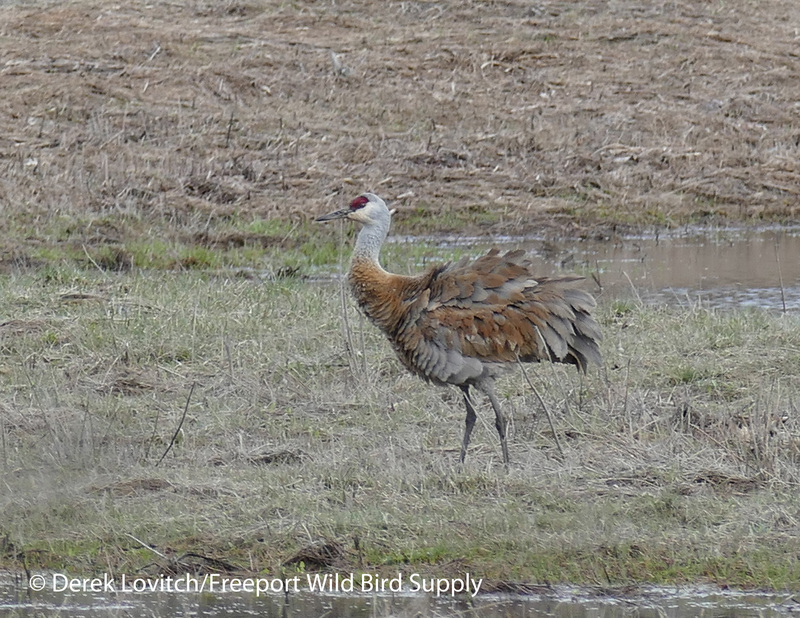 And of course, there is the extensively-rusty plumage. Again, although this feature is variable, this bird’s thoroughness of the staining, from the middle of the neck through the “bustle,” looks a lot like a Lesser to me. The bird was across the river from the park’s northern side, in a private field. Not that I was going to flush it, but if it was to take flight, I would have liked to photograph the wing pattern which could be an aid in identification. 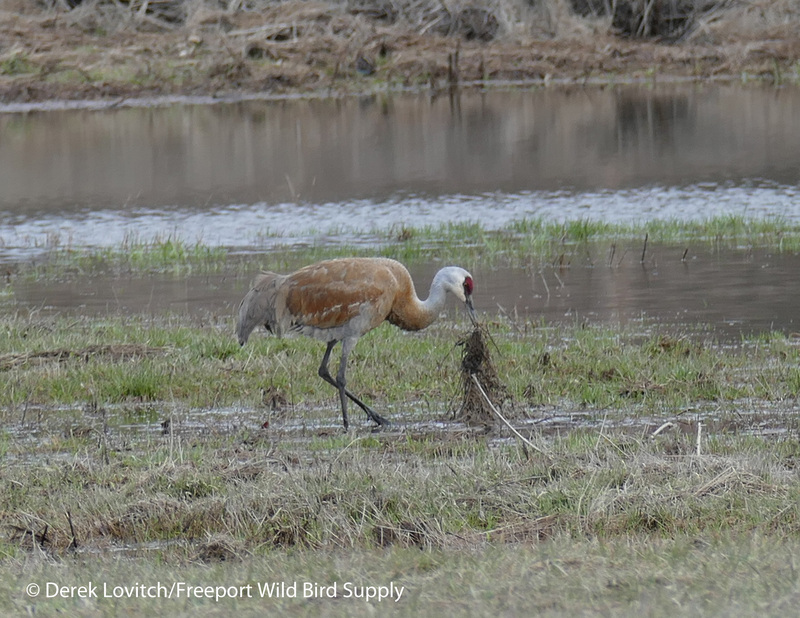 Intriguingly, however, a few hours later, Andrew had a Sandhill – the aforementioned 10th of the season – pass by the Bradbury Mountain Hawkwatch. We’ll take a look at his distant photos to see if we can figure out if it’s the same bird or not, and take a look at the wing pattern if possible. I have some more reading to do, and I will be sending these photos to some knowledgeable colleagues. However, with Feathers Over Freeport this weekend, it might be a few days before I can delve further into this intriguing bird. In the meantime enjoy and/or ponder some more photos, and stay tuned. 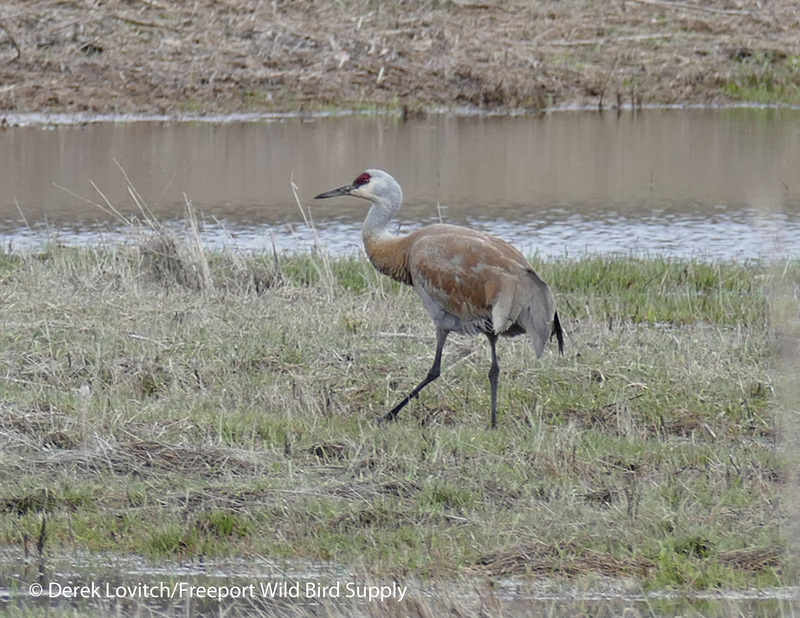 UPDATE, 4/27: As I suspected, comments received from friends and respected colleagues all agree that this bird looks very small, very small billed, and is impressively rusty (yes, even for spring). Those features combined would be rather coincidental, BUT, the spread wing shot would be helpful. But the reality is this bird is alone, and as I discussed, everything is subjective. How small is it really? How brown is it really? Of course, even if this was small enough and small billed enough, with a typical “Greater” standing next to it, subspecific identity is likely impossible based on our current knowledge. Individual variation (in both “Greater” and “Lesser”) is wide, and there is likely an intermediate population of the two subspecies that might render such analysis moot. Some even argue that it is more of a clinal issue and two distinct subspecies may not even exist. So, as expected, no firm conclusions can be drawn. We can prove nothing here. That being said, for those like me who are always learning, and always willing to learn, the analysis of such interesting individuals is worthwhile on its own, both to learn about status and distribution of cryptic species/identifiable forms and for our own personal growth as birders. 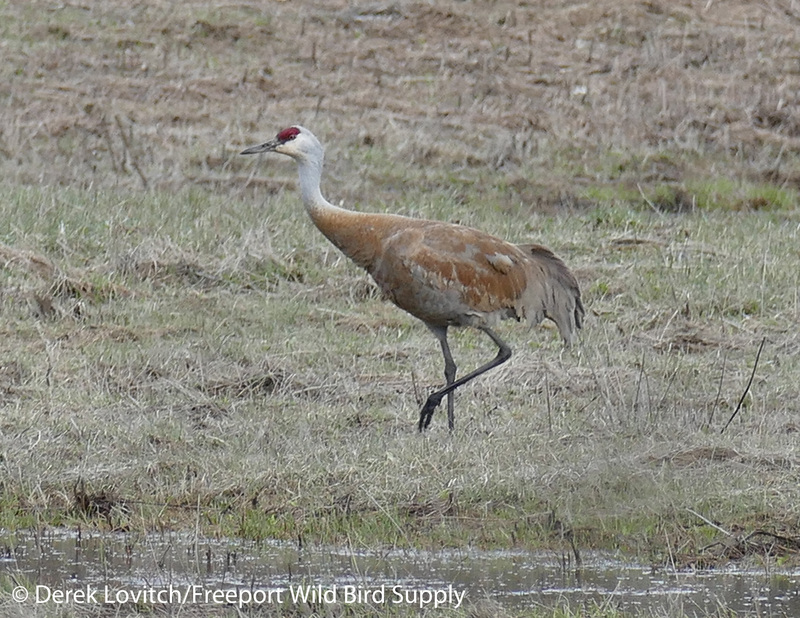 This entry was posted in Uncategorized and tagged "Birds, Birding, Greater Sandhill Crane, Lesser Sandhill Crane, North Yarmouth, Old Town House Park, Sandhill Crane on April 24, 2015 by Derek.